You know how much we Torontonians love our signs. I previously examined our love affair with signs after Ed Mirvish passed and I wondered what would happen to the Honest Ed's sign when that property is eventually re-purposed. Prior to that, there was the united cry to save the Sam the Record Man sign and the City TV truck and relief when they saved the iconic CHUM sign from demolition. Now I've learnt the mural outside concert hall Lee's Palace was torn down Tuesday. 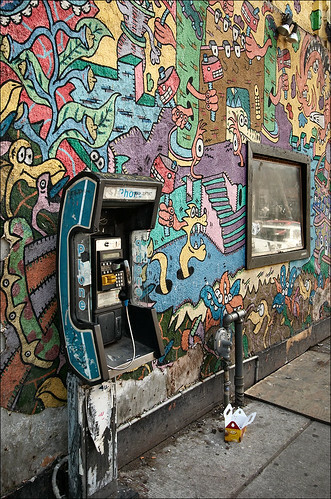 The piece by street artist Runt was created in 1986, before he re-did it in 1992. Thankfully, he'll be doing it again in the spring. "It's going to be comical, it's going to be cartoonish, maybe a little bit ..... I don't know," he said. "It's going to be absolutely fantastic." Image from daily dose of imagery. Wish I knew this before taking it down so I could of actually taken a good look at the mural first.